Beautiful Virgin of Guadalupe, I ask you on behalf of all my brothers and sisters of the world that you bless us and protect us. Give us proof of your love and kindness. Oh pure Virgin of Guadalupe, give me through your Son, forgiveness for my sins, blessings for my job, cure for my diseases and needs, and all that you deem necessary I ask for my family. Oh Mother of God, do not disdain the pleas we present to you in our needs. Amen. O Immaculate Virgin, Mother of the true God and Mother of the Church! You, who from this place reveal your clemency and your piety to all those who ask for your protection; hear the prayer that we address to you with filial trust, and present it to your Son Jesus, our sole Redeemer. Mother of mercy, teacher of hidden and silent sacrifice, to you, who come to meet us sinners, we dedicate on this day all our being and all our love. We also dedicate to you our life, our work, our joys, our infirmities, and our sorrows. Grant peace, justice, and prosperity to our peoples; for we entrust to your care all that we have and all that we are, our Lady and Mother. We wish to be entirely yours and to walk with you along the way of complete faithfulness to Jesus Christ in His Church: Hold us always with your loving hand. Contemplate this immense harvest, and interced with the Lord that He may instill a hunger for holiness in the whole People of God, and grant abundant vocations of priests and religious, strong in the faith and zealous dispensers of God's mysteries. Blessed Virgin Mary, Mother of Fair Love, protect our families, so that they may always be united, and bless the upbringing of our children. Our hope, lookk upon us with compassion, teach us to go continually to Jesus and, if we fall, help us to rise again, to return to Him, by means of the confession of our faults and sins in the sacrament of Penance, which gives peace to the soul. Thus, most holy Mother, with the peace of God in our conscience, with our hearts free from evil and hatred, we will be able to bring to all true joy and true peace, which comes to us from your Son, our Lord Jesus Christ, Who with God the Father and the Holy Spirit, lives and reigns forever and ever. Amen. be a true imitator of you. This I ask you, my dear Mother. charity--to always seek the good of others in need. Grant me this, I humbly ask of you. Son to send us many priests and religious. This we ask of you, O Mother. all members of the family pray and worship togeter. This we ask of you, O Mother. Dearest Lady of Guadalupe, fruitful Mother of Holiness, teach me your ways of gentleness and strength. Hear my prayer, offered with deep-felt confidence to beg this favor...(mention your intentions here). O Mary, conceived without sin, I come to your throne of grace to share the fervent devotion of your faithful Mexican children who call to thee under the glorious Aztec title of "Guadalupe"--the Virgin who crushed the serpent. Queen of Martyrs, whose Immaculate Heart was pierced by seven swords of grief, help me to walk valiantly amid the sharp thorns strewn across my pathway. Invoke the Holy Spirit of Wisdom to fortify my will to frequent the Sacraments so that, thus enlightened and strengthened, I may prefer God to all creatures and shun every occasion of sin. Help me, as a living branch of the Vine that is Jesus Christ, to exemplify His divine charity always seeking the good of others. Queen of Apostles, aid me to win souls for the Sacred Heart of my Saviour. Keep my apostolate fearless, dynamic, and articulate, to proclaim the loving solicitude of Our Father in heaven so that the wayward may heed His pleading and obtain pardon, through the merits of your merciful Son, Our Lord Jesus Christ. Amen. On the Crucifix:Our Lady of Guadalupe, Mystical Rose, make intercession for our Holy Church, protect the sovereign Pontiff, help all those who invoke you in their necessities, and since you are the ever Virgin Mary and Mother of the true God, obtain for us from your most Holy Son the grace of keeping our faith, of sweet hope in the midst of the bitterness of life, of burning charity, and the precious gift of final perseverance. Amen. First Apparition: Our Lady of Guadalupe appears to Juan Diego the first time. Our Lady requests a temple in her honor. 1 Our Father, then Meditation: Our Lady of Guadalupe, my Queen and my Mother, I thank you for your first apparition to Juan Diego when you revealed that you are the Most Pure Virgin, Mary. Mother of the true God and Mother of all mankind, I thank you for your requesting a temple to be built where you stood, to bear witness to your love, your compassion, your aid, and your protection for all who would love you, trust you, and invoke your help. Second Apparition: Our Lady of Guadalupe appears to Juan Diego a second time. 1 Our Father, then Meditation: Our Lady of Guadalupe, my Queen and my Mother, I thank you for your second apparition to Juan Diego when, upon his return from the Bishop's house, he knelt in humiliation and defeat before you since he was unable to accomplish your mission. I thank you for the courage and encouragement you gave to Juan Diego to make a second appeal to the Bishop. Third Apparition: Our Lady of Guadalupe promises a sign to Juan Diego for the Bishop. 1 Our Father, then Meditation: Our Lady of Guadalupe, my Queen and my Mother, I thank you for your third apparition to Juan Diego when after this unsuccessful attempt to have a temple built, you said to him, "So be it, son. Return tomorrow in order that you may secure for the Bishop the sign for which he has asked. When this is in your possession, he will believe you; he will no longer doubt your word and suspect your good faith. Be assured that I shall reward you for all that you have undergone." Fourth Apparition: Our Lady of Guadalupe fulfills her promise by showing herself on the tilma of Juan Diego. 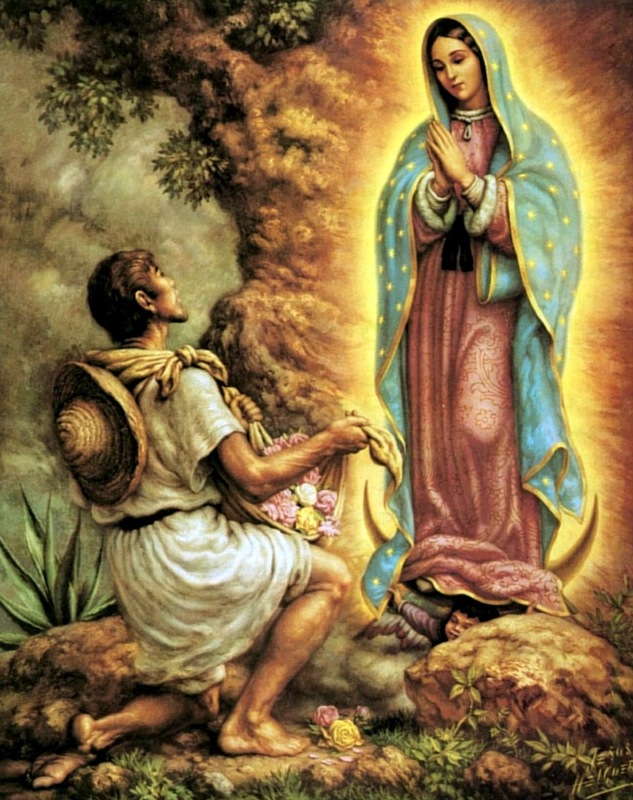 1 Our Father, then Meditation: Our Lady of Guadalupe, my Queen and my Mother, I thank you for your fourth apparition to Juan Diego when you ordered him to pick the roses he would find on the summit of the hill and bring them to you. I thank you for arranging them in his tilma when you said, "this cluster of roses is the sign you shall take to the Bishop. You are to tell him in my name that in this he will recognize my will and that he must fulfill it. You are my ambassador, wholly worthy of confidence. Only in the presence of the Bishop shall you unfold your mantle and disclose that which you carry." I thank you for your image printed on the tilma which appeared when the roses were released. Closing Prayer: Remember O Most Gracious Virgin Mary, that never was it known, that anyone who fled to your protection, implored your help, or sought your intercession was left unaided. Inspired with this confidence, I fly to you, O Virgin of Virgins, my Mother, to you I come, before you I kneel, sinful and sorrowful. O Mother of the Word Incarnate, despise not my petitions, but in your mercy, hear and answer me. Amen.